I’ve had this one on my shelf for a couple of years, waiting for the pull to read it. I knew it was about ballet dancers, and since I’m not particularly into ballet, I’d glance at the title, remember it was about ballet, and decide to read something else. But that’s silly because of course it’s not about ballet. It’s about relationships and the decisions people make or don’t make. Joan grew up a young American ballerina in 1970s Paris. Impressionable, as most young people are, no matter their focus, she got swept up in the drama backstage, making choices that ultimately changed the trajectory of her life. She grew up, left the spotlight, and tried to lead a normal life of some sort in suburbia as a wife, mother, and studio instructor. It is only when her young son, Harry, shows a penchant and interest in dancing that she realizes she cannot leave the spotlight altogether. Her husband indulges them, though he is that antithesis of a ballet dancer, an academic who appreciates the art but would rather spend his time doing a dozen other things. As Joan grows into her role, she is challenged by old demons, haunted by the very decisions that defined her, and now – as a mother – must decide when to step in and when to bow out. Astonish Me – or, Etonnez-moi – is a book that I both enjoyed and did not love. Joan is a difficult person to understand and appreciate; her persistence and passion is admirable on a professional scale, but she continued to do things that annoyed me. She is openly, obviously unhappy and unable to be made happy. It’s a subtle, growing torture. 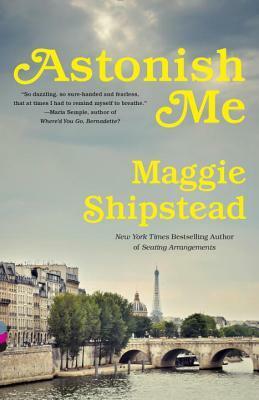 For those who enjoy literary fiction, you will appreciate the writing style and fluidity of Maggie Shipstead’s words. You will see beyond the sadness and appreciate what’s being done here. If you prefer light beach reads, fun thrillers, or fast-paced suspense, this isn’t for you. It’s far too sad.